Perhaps unsurprisingly, there's been an increasing amount of coverage in the industry press with regards to the impact of the Chinese and their technology in the imaging supplies marketplace. This coverage is mostly negative and appears designed to confuse and intimidate potential resellers of these products and to delay or block their introduction into the distribution channels. To survive, resellers must revisit their business models as part of their development of a digital transformation strategy. This revisit should include a thorough evaluation of new-build cartridges and how they can become part of an enhanced value proposition. A group of unqualified persons have emerged that are pre-judging new-build cartridge technology and applying the blanket term "clone" to all new-build cartridges coming out of the region. The intellectual property underlying ink and toner cartridges is of staggering breadth and complexity. There are very few organizations and individuals in the imaging supplies industry with a sufficiently deep knowledge of the intellectual property surrounding these products to pass an informed opinion of what constitutes a clone cartridge and what doesn't. Criticism is being directed at respected members of the aftermarket industry as their positions on new-build compatibles versus remanufactured cartridges are modified. Eastman Kodak put on the blinkers, killed their own digital initiatives from within and ended up in a Chapter 11 bankruptcy. The coal industry lobbies its political representatives pushing for legislation to subsidize its obsolete business model. The automotive industry faces a massive threat from Uber self-driving cars and Tesla electric vehicles. The oil and gas industry faces its own threat from alternative energy sources and power storage technologies. The hotel industry faces transformational threats from AirBnB. I could go on and on with dozens of other examples. The point is the world is changing. The Internet has changed everything. The biggest players (OEM's) may be disintermediated as more and more information technology is deployed and the means to effectively circumvent traditional distribution channels are developed. Consumers are quickly becoming empowered to save billions of dollars! "During the summer of 2016 I was fortunate enough to spend a few weeks in Australia. I visited a macadamia nut plantation in northern New South Wales and chatted with the owner. I was stunned to learn he was under contract to a behemoth food products distributor for every macadamia nut he harvested - at $5.00 per kilo! In the supermarket, I had to pay over $40.00 per kilo. Now, how did $35.00 of value get added in between the plantation and the retail shelf?" Think of an OEM printer cartridge with a $100 retail price when it only costs around $10.00 to manufacture! Think how the office products distribution channels are controlled and think how the OEM's have an 80%+ market share. Think how that share is increasing as color takes over and mono declines. There's nothing rosy about the outlook for independent resellers in this scenario. Clinging to the historical business model of remanufactured versus new-build is similar to the futility of Kodak hoping the inconvenient truth of digital would go away the longer they ignored it. Niche businesses from our analog past can thrive. For example, here in Nashville, United Record Pressing manufactures 40,000 vinyl records per day, accounting for up to 40% of all vinyl available in stores, and is currently expanding its operations. Kodak, in the mother of all ironies, is apparently investigating what it would take to bring back Kodachrome film. According to CMO Steven Overman, in a podcast recorded live at CES in Las Vegas, he talks about Kodak's Super 8 camera and the possibility of bringing back old film stocks. One day (perhaps), there will be a similar nostalgic demand for remanufactured ink and toner cartridges! It may be unfortunate for the U.S. and European aftermarket manufacturers that China has evolved to become the aftermarket imaging supplies capital of the world. However, that process started more than 20 years ago and is unlikely to be reversed. It should not be forgotten that we took the industry to China, whereupon the Chinese subsequently embraced and invested in it. From the origins of Pelikan's factory in the Guangdong Province in the mid-1990's to Nu-kote's partnership with Arnald Ho's Print-Rite in 1998, the industry was delivered to China on a plate! With hindsight, and whether or not this was the right thing to do, it's now immaterial as the clock cannot be turned back. Now, don't get me wrong, "real" clone cartridges are a big problem, and have become one of the many transformation headwinds faced by resellers. However, first, a clone must be properly defined because it's simply not right to call all new-build compatibles clones. ETIRA did a first-class job of this back in April 2012 with their Guide to Clones publication. Clones and counterfeit are not terms that can be used interchangeably to describe the same product. There's an important distinguishing feature of a counterfeit product in that it's marketed with the intent to deceive as it incorporates both the "look and feel" of an OEM product and its packaging. However, don't forget, over the years there have been many instances of remanufactured cartridges in counterfeit packaging so, a cartridge doesn't have to be of an infringing, new-build cartridge design to be a counterfeit. Take a close look at the three definitions for a clone. Look carefully at the first two - " .... patented OEM technology replaced by inferior technology replacements (no patent infringement)". Maybe it's "inferior technology", maybe it isn't but, the market must determine this. If new-build cartridges don't infringe third-party patents, and they're not marketed in a misleading way so they appear to be genuine OEM brand cartridges, then they should be free to be sold and the market will determine their success or failure. If they don't work, no one will buy them but, this doesn't make it right to call them clones. Look also at definition # 4 - "IPR Free" compatible. It "looks different, no OEM brands used, no OEM patents used". This make it a legitimate, new-build compatible, not a clone! The thing is, there aren't many people around who have sufficient knowledge, or qualifications, to determine whether or not new-build cartridges infringe third-party patents. The industry media certainly is not qualified to do so. Furthermore, even if every single patent relating to ink and toner cartridges were discovered, read, and understood by the aftermarket manufacturers, then each of these patents is still open to interpretation. How an OEM may interpret its patent may be different to how an aftermarket competitor interpreted it. 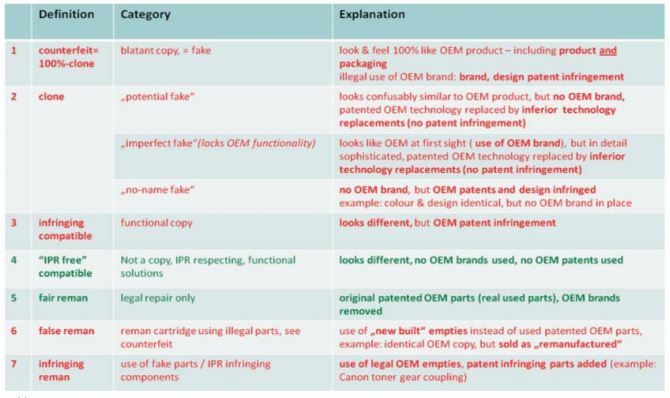 A patent dispute, arising out of two different interpretations of the claims, does not automatically mean the disputed technology causes the cartridge that depends on it to be correctly labeled as a clone. Apple and Samsung have been involved in patent litigation for years - does that make the Samsung Galaxy a clone of the iPhone? Illegal clones are bad for everyone and counterfeiting is bad for everyone. However, misleading headlines and the bucketing of legal cartridges with illegal ones just because they are new-build is also bad for everyone. The aftermarket imaging supplies business faces tough challenges, not least from the existing distribution arrangements and the power the OEM's have over these office products distribution channels. Remanufacturing, and the evolution of the aftermarket, may have a lot of nostalgia attached to it but, times have changed, and we have to move on. The OEM's and major western remanufacturers are desperate for the new-build cartridges to fail because they represent the single biggest threat to both of their business models. For the independent resellers (largely born out of the independent remanufacturer heritage) their best chance of success is to embrace legitimate new-build cartridges and to start competing with the OEM's and big-box resellers for their currently over-priced business. In fact, instead of being a threat to the independent reseller and the aftermarket industry, legitimate new-builds are a threat to the established order and the single biggest chance of survival for those, that some elements of the media purport them to be the ruin of! It's no surprise to me that, one-by-one, leading industry experts, who have taken the time to open their minds and look forward rather than backward, have been faced with no alternative but to recognize the legitimacy of non-infringing new-build cartridges and to understand these products represent the best possible opportunity for independent resellers to thrive in a difficult market. This does not make those individuals traitors to the foundations, or the heritage, of the legitimate aftermarket imaging supplies industry. Rather, they are the equivalent of the digital change-makers at Kodak who, unfortunately, failed to break down the barriers of the past within their organization as it went into its death spiral and, ultimately, failed. Hopefully, with more and more understanding the importance of non-infringing new-build technology, that same fate doesn't await the aftermarket and the imaging supplies industry we're still striving to develop today. If you missed my eight-part series on the aftermarket tipping point, please check out my new eBook, it's just published, it's FREE, and it contains a thorough examination of Mergers & Acquisitions in the office supplies industry and a path to the $20 billion growth opportunity for independent resellers.